Lately, I've been seeing beautiful strawberries everywhere while grocery shopping, so naturally, I picked some up to bake with. 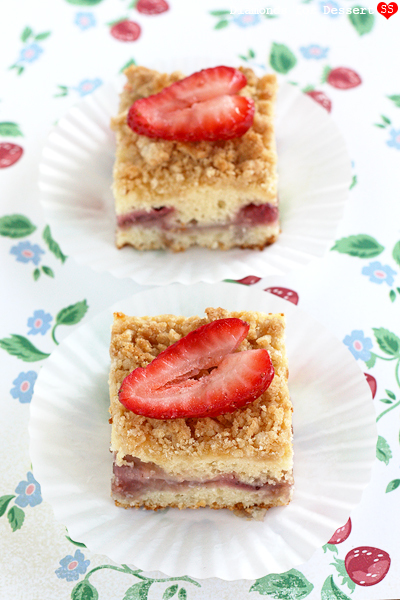 With so many strawberry desserts out there, I finally decided to make a fresh strawberry coffee cake, as I need to post more go-to, everyday type recipes here. This is one of those cakes that's perfect for anytime of the day, a great companion to your morning coffee at breakfast or a lovely mid-afternoon snack. 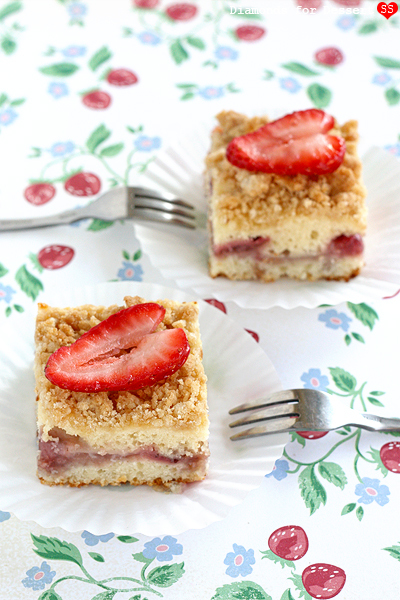 It can be served warm or cold, and though the recipe makes a whole tray of cake, it goes quick! There's cream cheese in the batter, which keeps the cake moist and gives it a richer flavor. 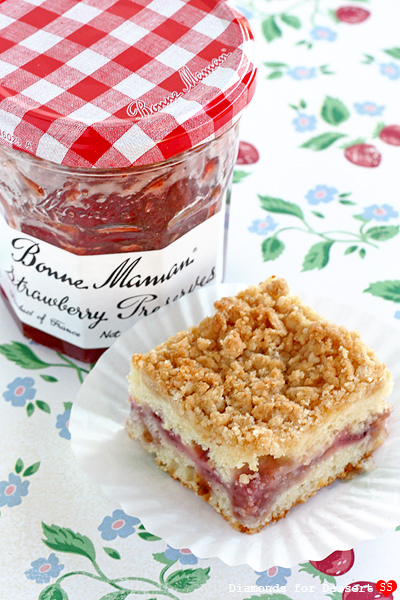 The combination of fresh strawberries and strawberry preserves gives the cake that wonderful berry flavor, and the stripe created by the layer of strawberries and preserves gives the slices of cake a nice bit of color. The original recipe tops the cake off with chopped nuts, but I decided to use a crumb topping instead as I love crumb coffee cakes. Also, another plus about this cake recipe is that it's not too sweet, another reason why it's a great anytime cake. Spring is here! Today really felt like spring. 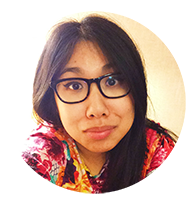 I noticed pretty flowers blooming all over, the sun shined brightly, and birds were chirping. 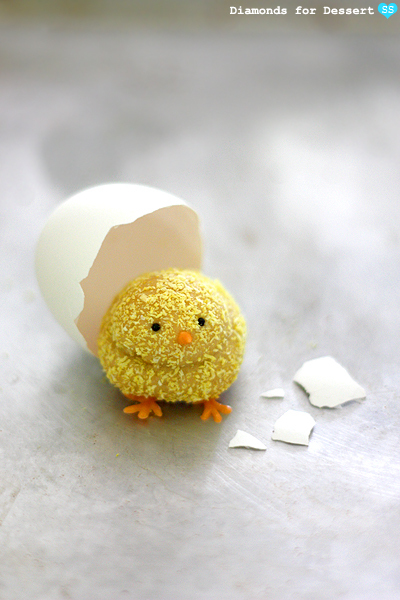 Hope you all had a good Easter! I celebrated by making some chick cookies. 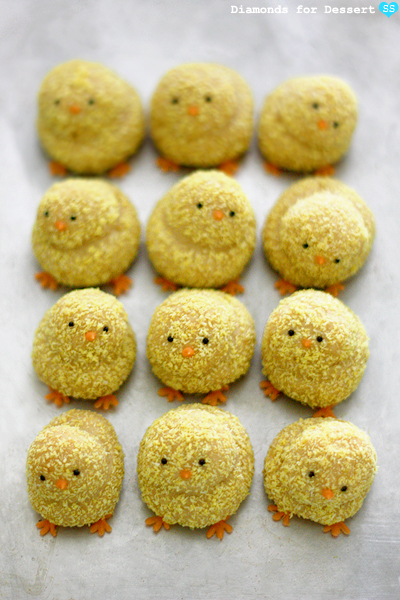 I already made chick sugar cookies two years ago for Easter, but this year I thought instead of flat decorated cookies, I'd come up with some actual 3D chick cookies. After some trial and error, these turned out pretty well. 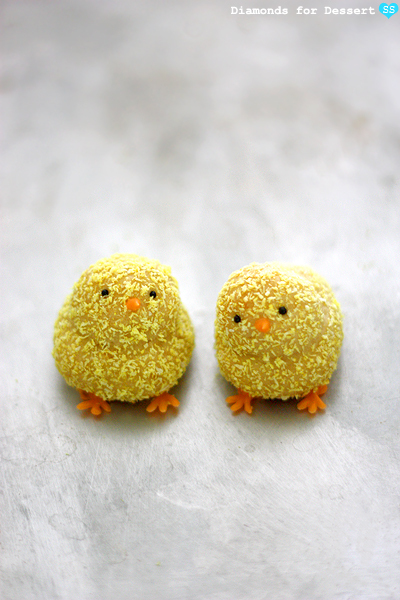 They're the perfect springtime cookie. Since Easter usually involves lots of candy like chocolate rabbits and jellybeans, I decided to make a cookie that was less cavity-inducing than the typical Easter dessert. I found this recipe that makes a nice, lightly sweetened cookie. I love the combination of lemon and honey. Because the recipe only uses a little bit of butter the resulting texture of the cookie is soft and cakey, in a good way. Finally, the coconut adds a hint of flavor and some cheery color. Enjoy! I watched The Hunger Games movie the weekend right after it came out. Overall, it was pretty good (I'd watch it again), but like most movie adaptations, not as good as the book, which I absolutely adore. There were many things I enjoyed about the movie. The casting was great, especially the actors cast for Cinna, Effie, Caesar Flickerman, and Rue (hoping for an equally good cast for Catching Fire: Finnick!!!). Non-spoiler things I enjoyed in the movie: Seneca Crane's beard, the fire dress (exactly how I imagined it), and awkward Gale scenes. Anyway, if you haven't read the books, I highly recommend that you read them! In particular, read Catching Fire, my favorite :). 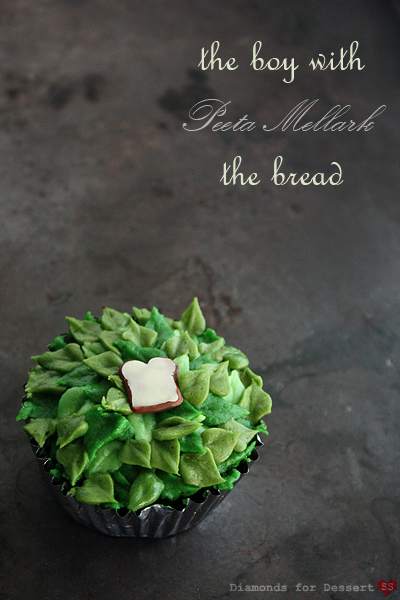 I've been meaning to bake something Hunger Games themed for a while. 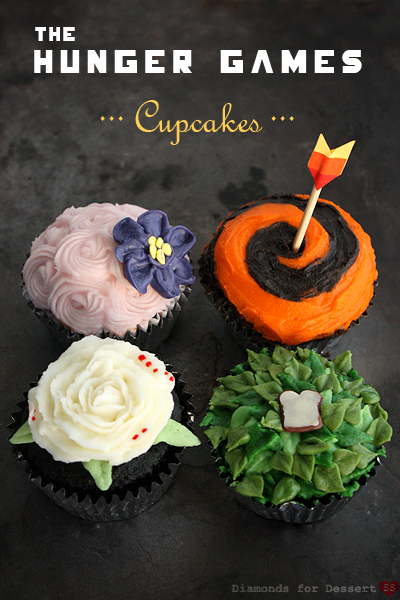 Finally, I decided to make cupcakes based on different Hunger Games characters. 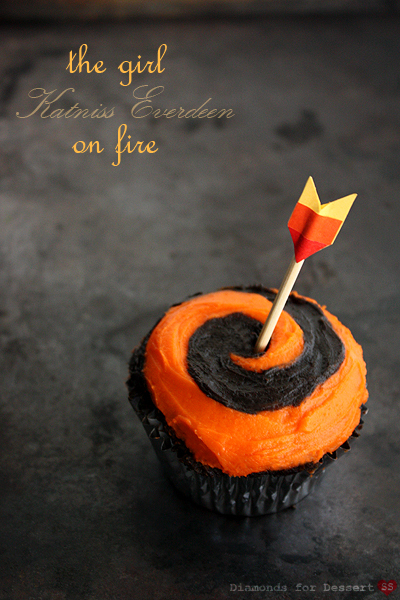 Since Katniss is the protagonist, I had to make a cupcake based on her. These were inspired by the costume she wore to represent District 12 (the black one that lit on fire) and her archery. Peeta is my second favorite character, after Finnick, so he got cupcake as well (sorry Gale, Peeta's the nice, artistic boy who paints and bakes). In the arena, he uses his awesome cake icing skills to imitate nature in order to camouflage himself, so I topped off his cakes with pretty, "natural" frosting leaves. And because he is the "boy with the bread", I finished each cupcake with a chocolate bread slice. 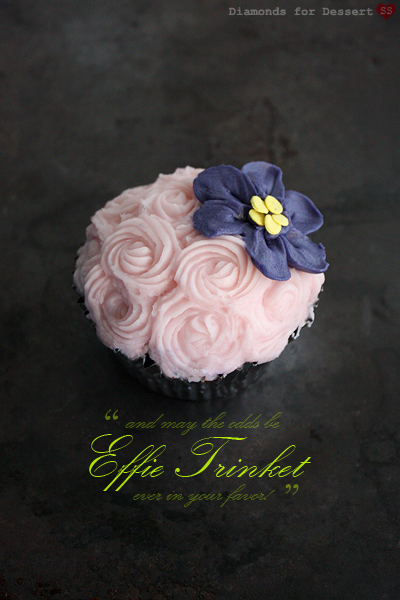 I loved Effie's "look" in the movie, so I thought to take an element from her appearance and adapt it to a cupcake. I ended up representing her hair with curly pink swirls of frosting and adorned the frosting hair with big purple flowers. 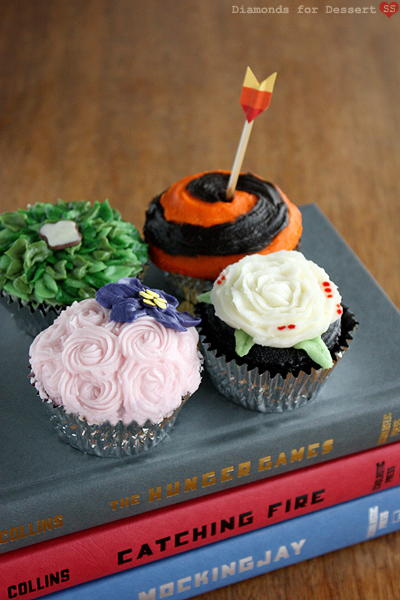 Of course the villain of the story needs to be represented as well, so President Snow got a cupcake as well. His signature items are the genetically modified white roses always pinned to his lapel, which he uses to mask his bloody breath. 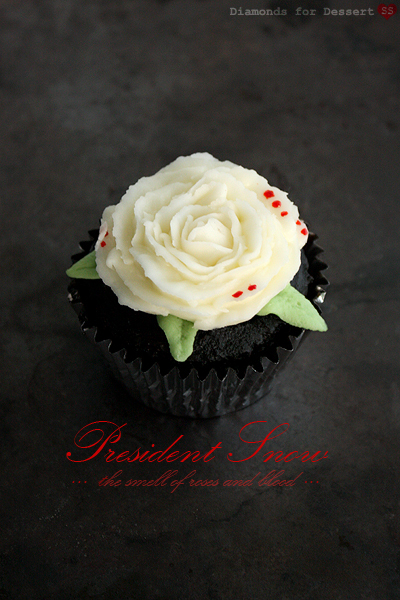 Thus, my cupcakes based on him are iced in black and topped with white blood-stained roses.